Good match vs. bad match; that is the heart of the duplicate problem. A good match is when a new record that can be perfectly matched to an existing record, is merged accordingly and no duplicate is created. A bad match is when a new record can’t be matched to an existing one and creates a duplicate. What are the situations to look for that create duplicates? Here are the four entry points for duplicates and how to stop them cold. Inaccurate: People make mistakes, data is entered incorrectly, and that triggers a chain of events. Incomplete: Not entering full information such as a phone number, title or email can leave gaps in the data. Gaps in the data lead to ambiguity. Without a basic set of data, no system or person can match a record if critical information was never saved. Poor Process: Sales reps like to make calls and talk, they don’t like to manage their CRM. Not taking the time to see if a record already exists is #3 in the human shortcomings of data entry. List imports are a bane to the CRM administrator. Nothing degrades thousands of records faster than importing a list without automatically enforcing great matching rules. Here is the rub; even with perfect rules, data may not match up due to lack of information to make a match. Incoming leads are very similar to list imports. It is the same concept except the leads are usually coming in one at a time versus in batch. The difference lies in the order of operations and how quality data is being enforced. 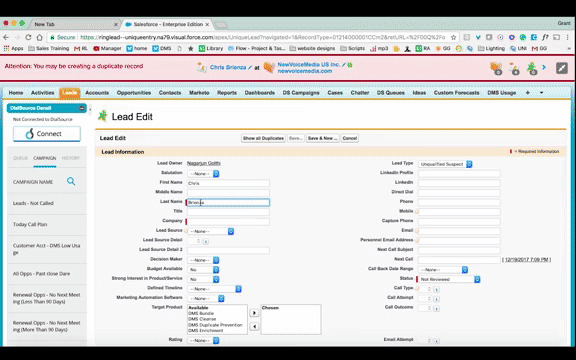 A lead routed incorrectly from a web form can get lost, and no one wants to lose leads. You can have everything set up perfectly, but what if you have an application attached to your CRM? It can wreak havoc on data quality. Everything else can be handled and set up to match and merge the way you want, but connected systems with access to your CRM or Marketing Automation System are outliers. So how you can prevent duplicates from entering your database? Training is critical to any sales operation, but training alone won’t stop duplicates from entering your CRM. The only way to stop duplicates, before they take hold, is through technological enforcement. Setting up processes that CRM users must follow is a process that gains nothing as it scales. The first prevention will cost the same as the next ten thousand. RingLead’s cloud-based DMS Duplicate Prevention tool can stop duplicates from entering your CRM from all of these points of entry to ensure a unified, clean, and streamlined database in real time. Watch our DMS Duplicate Prevention video below to learn more!